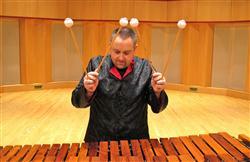 Throughout his career, Koshinski has worked with many notable performing organizations and artists including NFL Films, Late Show with David Letterman, Mary Wilson (the Supremes), David Samuels, Wycliffe Gordon, Tom Harrell, Ingrid Jensen, Denis Diblasio, David Bixler, Philadelphia Boys Choir, The Lettermen, Hartford Symphony, Minnesota Ballet, and is currently section percussionist for the Duluth Superior Symphony Orchestra and a member of Nebojsa Zivkovic’s Jovan Perkussion Projekt. For his work with NFL Films, he can be heard on the Emmy award-winning soundtrack A Century of NFL. Performances have also been heard on the CBS, PBS, and ESPN television networks as well as NPR. In addition, he has recorded for the Naxos, Innova, MSR Classics, and Equilibrium record labels.